Foliar or drip application – efficient, rapid mineral uptake. Amino Acid chelated form of iron. Iron deficiency in plant determined by test, observation, or known nutritional needs of certain plants and/or systems. 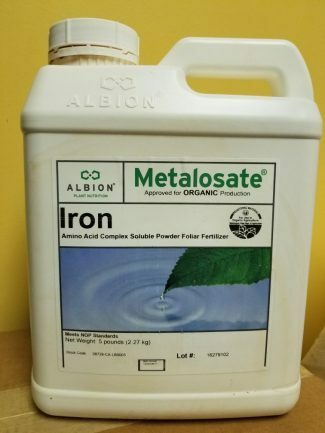 Albion Metalosate Iron provides easily absorbable and “plant friendly” iron for immediate use by the plant. What Are The Metalosate Products? Albion Metalosate Iron is highly water soluble, with excellent uptake efficiency when applied as a foliar spray or through drip irrigation. Visit the manufacturer’s web site for additional product information.